Has anyone experienced the Live Support? Or ever actually seen an Adwords Specialist available? Anyone?………….Anyone? 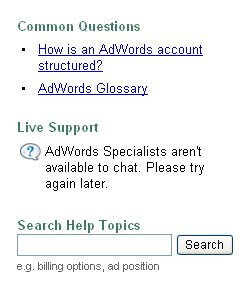 Hi, I did have one opportunity to chat live with an adwords specialist. It’s a pleasantly surprised experience for me; the specialist is VERY knowledgeable and address my issues/questions specifically (And I was NOT asking basic questions). This is unlike those “canned” reply you get from other “live chat” support line. I’m so impressed, I saved the dialogs. However, I forgot where I found that live support link now – buried in some deep pages with Google help perhaps?